Yath (also spelled Vathi) is a large island in the Yokudan archipelago, between the Azurian Sea and the Sea of Pearls. In the late Second Era, there was a settlement named Makan on the west side of the island. The small island of Bahia is its nearest neighbor. Due south of Akos Kasaz, Yath is arid and rugged, with a spine of jagged mountains. Colonists from Yath, led by King Xakhwan, were responsible for exterminating the Corelanya Clan along the coasts of Hammerfell during the Yokudan migration in the ninth century of the First Era. They also settled in the Ayleid ruins of Salas En, inhabiting the site for over a thousand years until being driven out around the time of the Thrassian Plague. 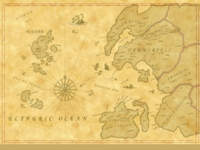 The alternate spelling Vathi is seen on the map of West Tamriel, but the island is called Yath in other sources. This page was last modified on 28 November 2018, at 06:20.